“Good grief! They are using Quads!” I used to use Quad ESL-57s in the mid 1980s before I moved to the US and in some ways, no other speaker has come close to the sonic transparency offered by these idiosyncratic-looking electrostatic speakers. 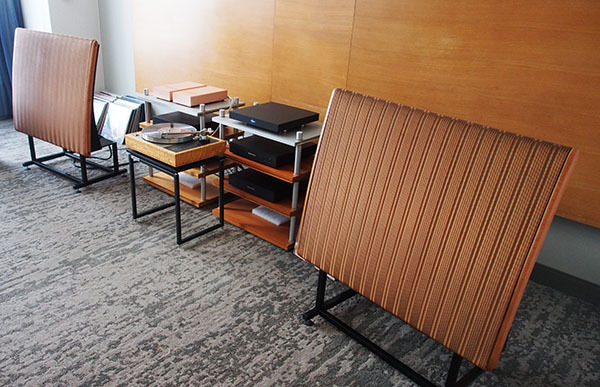 But to see and hear an original pair dating from 1958 in the room shared by Michigan dealer/manufacturer Nokturne Audio and Lejonklou HiFi from Sweden was a highlight of the 2019 AXPONA. 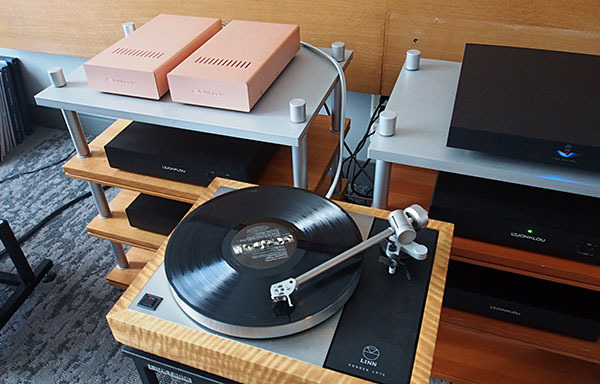 The Quads were being driven by a Lejonklou Tundra 2.5 amplifier ($4950), a Lejonklou Sagatun 1.4 preamplifier ($4950), and the front end was a Linn Sondek LP12, with its Radikal power supply. The NOKtable turntable stand looked identical to the excellent Archidee TNX table form Italy that I bought too many years ago to mention, and which looks like two metallic U’s, one behind the other and joined at the tops of the sides, with a platform supported by four upturned spikes. Looking more closely at the system as I enjoyed “The Blues and the Absolute Truth” from saxophonist Oliver Nelson, I wonder what the two copper boxes were behind and to the right of the turntable. Turned out they were Lejonklou’s new SINGularity mono moving-coil phono stage, which costs a whopping $42,700/pair! Designer Fredrik Lejonklou started with a design he had been experimenting with for seven years and took it to the limit. Separate switch-mode power supplies are used for the positive and negative voltage rails and Fredrik says that he listened to every possible choice for every component before deciding on the final bill of materials, including orientation of ground wires, fuses, and resistors. As Fredrik assembles and hand-solders every circuit board, as well as doing the final assembly and testing, this is a truly unique product—indeed a singular singularity!